Top class elegance is etched into this resplendent earring set with a combination of deep crimson color and antique-style design. Featuring a 925 sterling silver base with stylishly curved designs, each earring has a rounded square edge with prongs rising from each edge to hold down the round cut 1.64 Carat garnet gemstone. Beautifully and artfully set into the sterling silver base and surrounding the 6mm garnet stone are 0.07 Carat diamonds numbering twenty-four. This cluster pools the diamonds' glitter thus providing a stunning, shimmering effect to deepen the lightening effect to the garnet stone and make the earrings even more attractive. 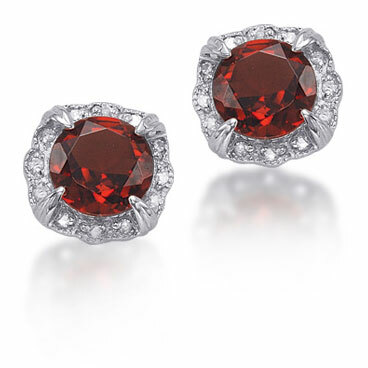 We guarantee our 1.64 Carat Garnet and Diamond Antique-Style Sterling Silver Stud Earrings to be high quality, authentic jewelry, as described above.